Welcome to my RIT SE department home pages! I started at RIT in December 1997 beginning in Computer Science providing support to the Software Engineering program while it was still part of that department. I moved full-time to Software Engineering in July 2002. I came to RIT from across town where I got my PhD in Computer Science at the University of Rochester. Prior to those PhD studies I had been working in industry for a number of years at AT&T Bell Labs, AVL and Siemens Corporate Research. For those who are interested, you can find more details about my background by looking at my formal resume. For the academic year 2005 - 2006, I was on professional development leave looking at the use of software in safety-critical systems. From July 2010 through June 2015, I was the department chair for software engineering. This included leading the department through our conversion from a quarter to semester academic calendar and the first two years on semesters. During this time, the undergraduate program grew from 315 students to just about 500. Our graduate program also grew during this time from 15 to 20 students to 50 to 60 students. With the growth in our program, we created a new position of Undergraduate Program Director. I was in that position for one year (July 2015 through June 2016) before moving to retirement transition for two years. Another major responsibility for me has been coordination of our senior project program which I have done since 2003 and will continue through June 2019. I retired in the summer of 2018, and continue to be engaged by teaching one course per year as an adjunct instructor. I knew that it was time to retire when our undergraduate software engineeirng program became a clue on Jeopardy. There was nothing more that I could do to promote the program! My teaching interests are on the design side of our program. At some point in my career in software engineering, I have taught the following courses, and had a large impact on the content in them. My curriculum work in these courses is described in several publications listed here. The title of my PhD dissertation was Interactive Augmented Reality. For an introduction to this area and the research work I had done look at my augmented reality web pages. One of the pages has MPEG video clips of my working system. You can also navigate to many other sites on the web specializing in augmented reality by following links I have provided. On a more personal note, I have a page describing some of the fun recreational things that I do. 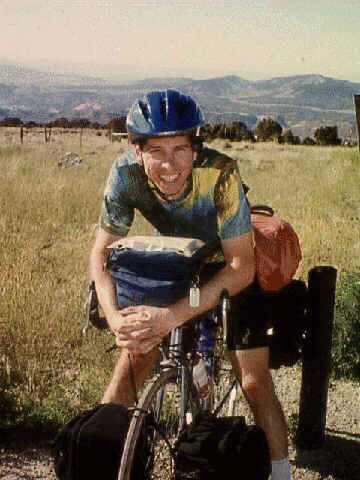 If you want to read about and see photos from Jim's Greatest Adventures then check out the web pages for the cross-country bike tours I took during the summers of 1996 and 2003.